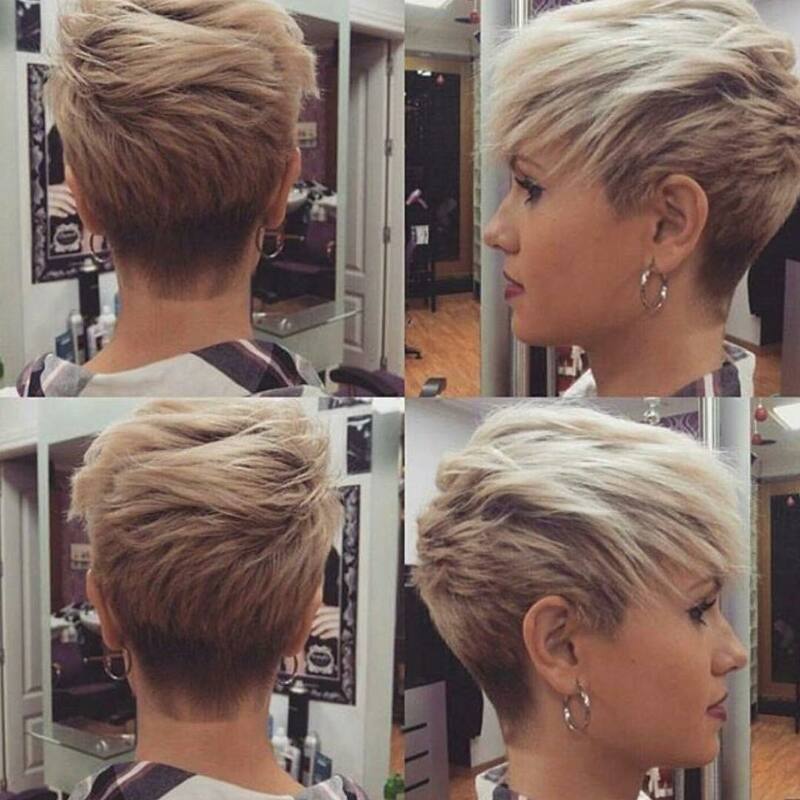 10 Short Haircuts for Fine Hair 2019: Great Looks from Office to Beach! 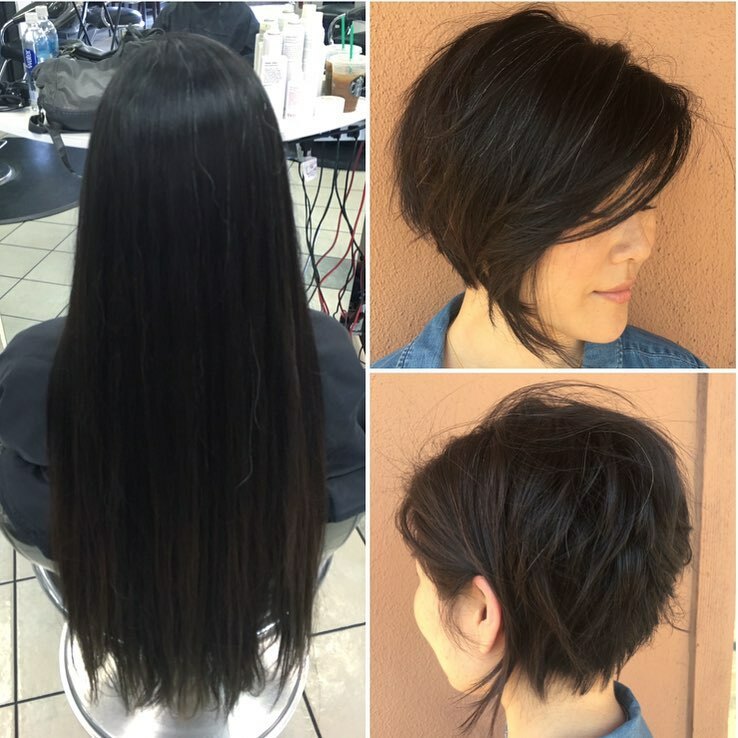 Trendy short haircuts with layers are a great way to get the best out of fine hair. Short pixies or bobs always draw attention to your eyes and there’s a flattering style for every face-shape. And everyone knows the latest color trends and edgy cuts appear on short haircuts first! So say ‘Hello!’ to an exciting new ‘you’ with one of the latest short haircuts for fine hair. 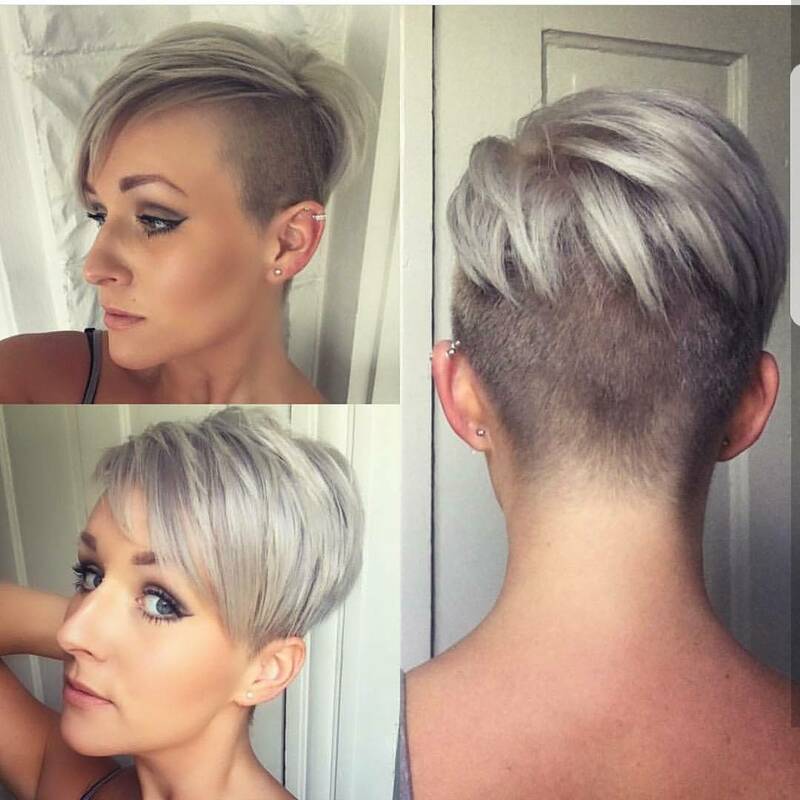 Instead of struggling to get density and volume into long, fine hair, this fashionable short haircut will cut your styling time down to next to nothing! Combed forwards with a fab horizontal section around the crown, this super-chic urban look will stay smart from dawn to dusk! I especially like the textured back sections in light to dark shades. As fine hair isn’t thick enough for stacked layers, the hair is divided into 3 different textures accentuated by bands of color! This platinum shade is softened by a beige toner around the crown and a hint of light-blue beneath. The roots are only slightly darker than the rest and there’s a nice round shape at the back. Even the nape has rounded ‘corners’, so this is a more feminine look than the white-blonde-black-roots versions. And with side-points halfway down the ear, this asymmetric pixie haircut accentuates your eyes in a groovy new hairstyle! For a fairly natural shade of blonde that’s totally up-to-the-minute, you can’t beat this light ash-beige shade! It’s a gentle way to turn mousey-brown/dark-blonde hair into a smart, chic look. The cut is edgy, with the back and sides buzzed short. However, in a light color they don’t have a harsh, shaved vibe. The deep, side parting creates an asymmetric, side-swept fringe that contrasts with the short, side point. This ‘hip’ modern haircut will keep you cool all summer long! Although long hair was once said to be a woman’s crowning glory – these days we’re more concerned with tailor-made haircuts! 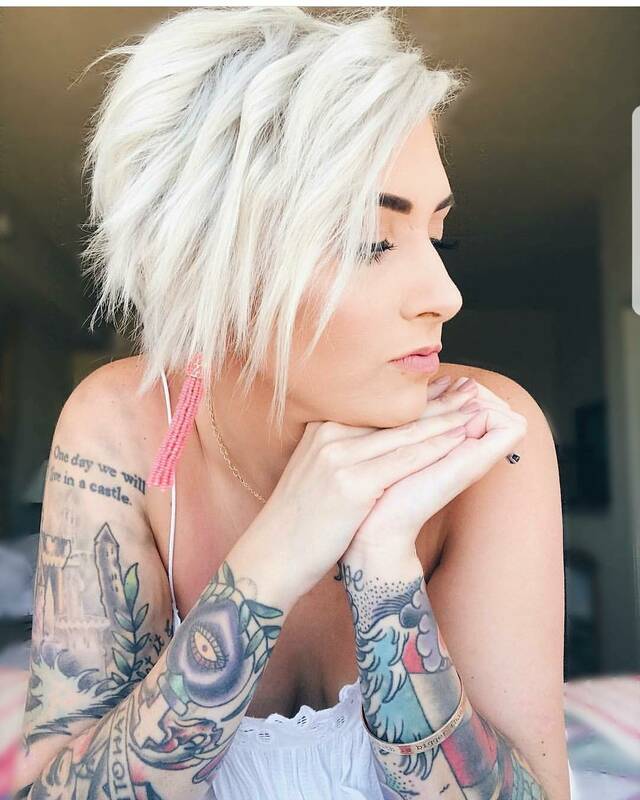 We can’t see the model’s face completely, but I know this short angled bob haircut will flatter her features far more than straight, long hair. The back has been layered so it’s easy to get a cute, fluffed-up volume and pretty texture around the crown. The front side-parting allows an attractive section of hair to skim the eyes and frame the face in a soft and feminine way. And for a casual look, just pushing the hair behind your ear is also a cute and modern style! Gray hair color trends have removed the barrier between fashion and naturally graying hair. This is great for over-50’s hairstyles, yay! There’s such a wide range of new color ideas for style-conscious women to enhance their graying hair! Embrace your gray with a playful color theme inspired by a windswept ocean. And cute, baby-blue highlights in the fringe add a youthful vibe. The fab horizontal texture under the crown is a trendy touch adding lively movement to a beautifully balayaged hair design! This edgy hair design is definitely ready to make an entrance at a special event! The hair has short, buzzed side-points but the hair has been trimmed into long sections above and below the blurred side parting. This matches the theme of ‘contrasts’, seen between dark coffee hair and the gorgeous beige-blonde and coral-red balayage. 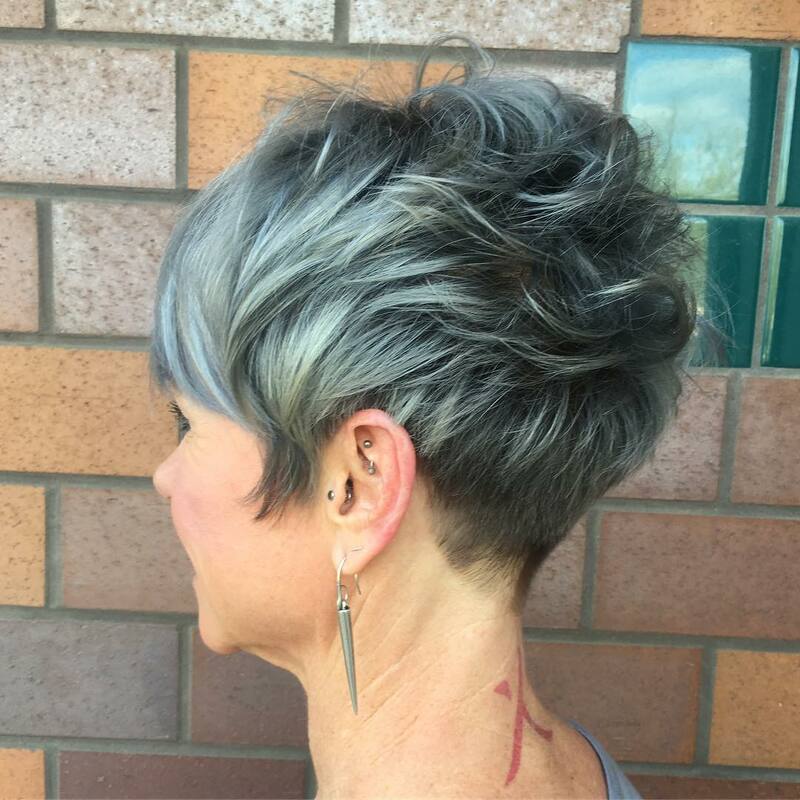 Defined wavy strands have spiky, tapered tips in another playful, windswept look taken to the extreme in this fantastic short haircut! 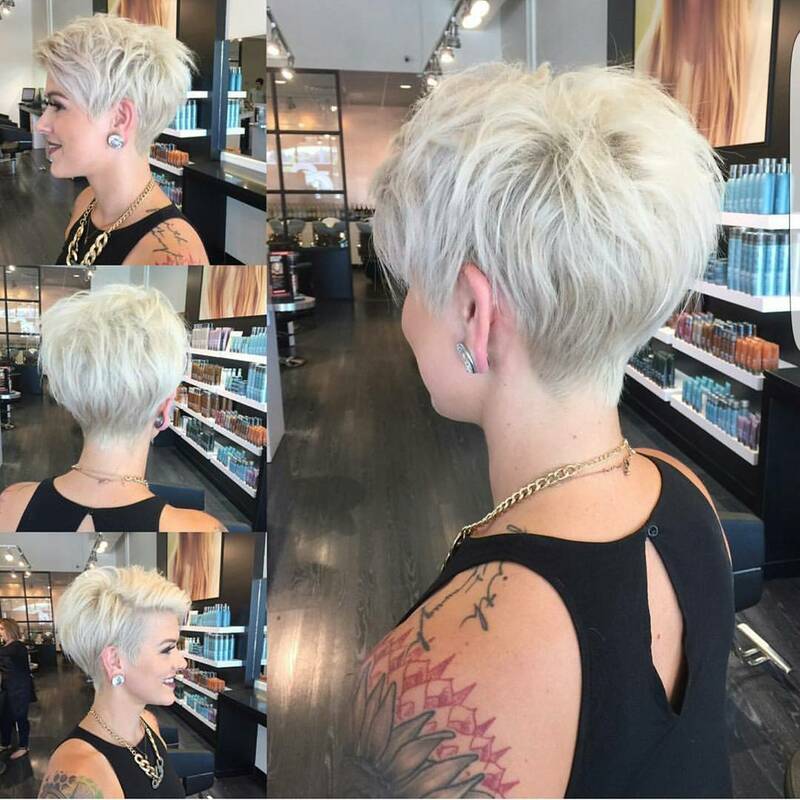 This young and trendy short haircut shows layered pixie cuts can have fabulous high texture with just a couple of dabs of styling product! 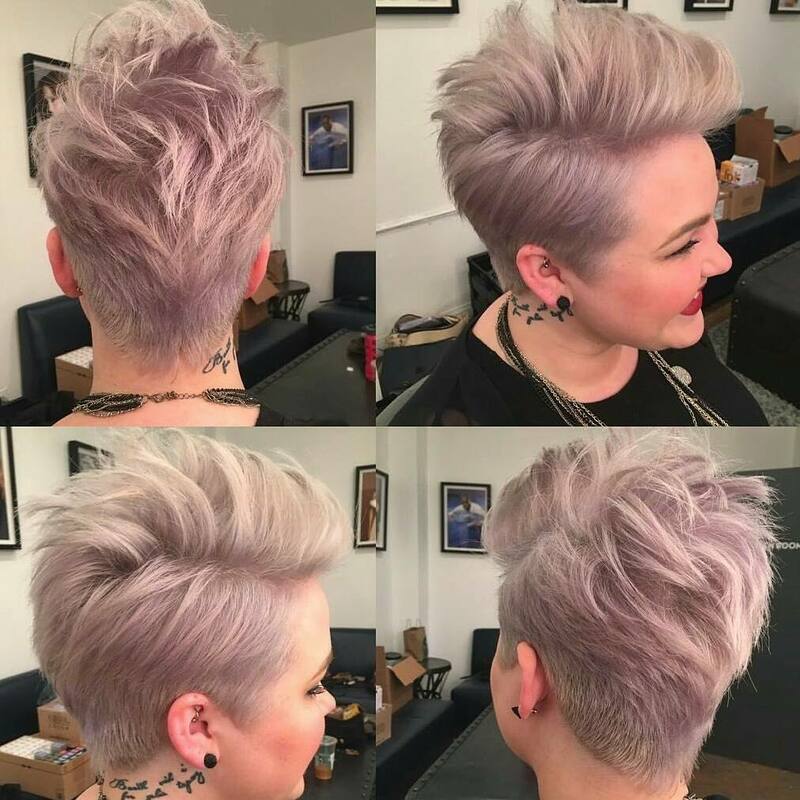 The colors are light beige-blonde with lavender-pink toner, which has been expertly applied between the quiff and the textured nape. There are no dark roots here, so the overall effect is soft and flattering to skin-tones with a warm undertone. No wonder the model is looking so happy – she knows this fabulous pixie cut suits her fine hair, and fashion look perfectly! Smoothly coiffed white- and silvery-blonde hair is a great style for all age-groups! As an over-50’s style it allows women to enjoy their naturally white tresses whilst wearing a youthful haircut that’s totally fashionable. And this style showcases the top part of the face, with gently-shaped side points and an attractive wave up and around the forehead. 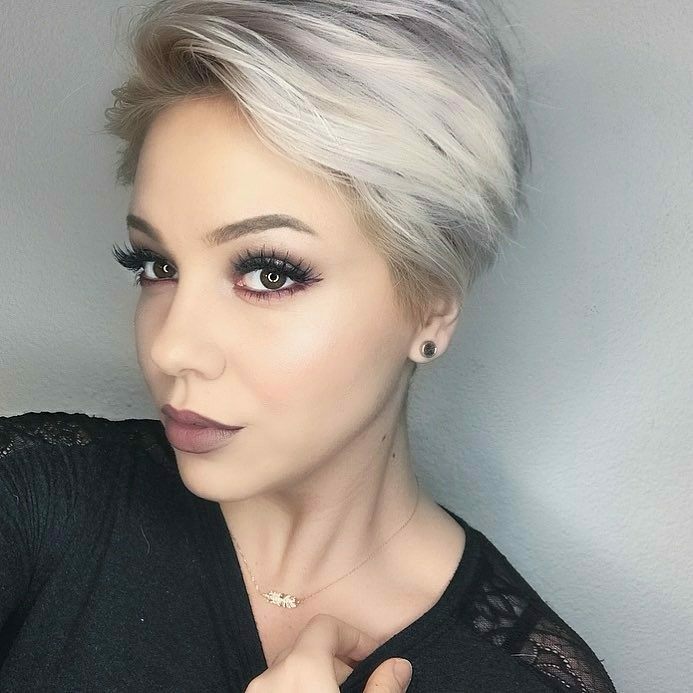 The white shade shows a touch of beige-blonde at the roots and there’s the tiniest hint of lavender toner around the crown. The color is cool, so it suits complexions with a cool undertone best and the soft, blue-based ‘plum’ lipstick matches this elegant shade beautifully! You’d never guess in a million years this used to be the regulation haircut for almost all U.K. schoolboys! However, this ultra-modern, buzzed back and sides’ style creates interesting texture with a clever use of contrasts. By defining and separating the straight layers, the stylist has added light and dark shading. This texture and light touches of purple toner help fine hair look thicker. Short side-points connect the upper and lower face and you can adjust the parting to flatter your face shape! We started off today’s gallery with a super-chic ‘urban’ hairstyle, so let’s finish with a hot, beach-bleached blonde. 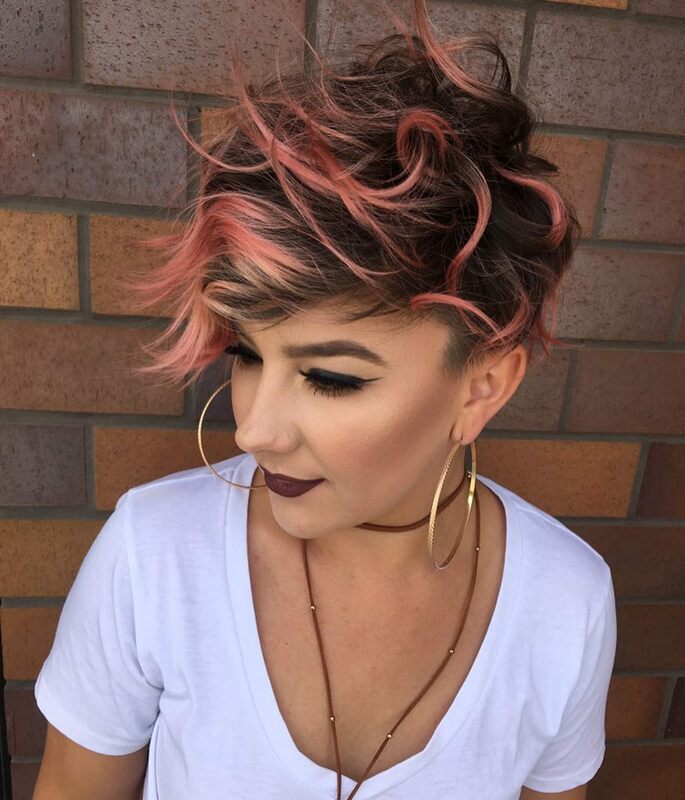 The idea for this edgy style is over-bleached hair, with a matte texture and shaggy, disconnected layers. Extreme bleaching has made this model’s hair-shafts thicker. (Never do it at home.) The thicker texture can have vertical, ‘sliced’ layers with sharply, tapered tips and a raggy, angled bob line! 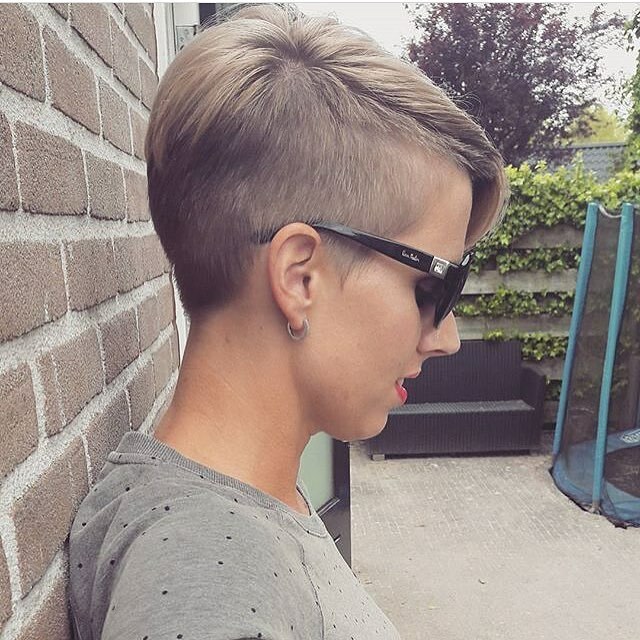 This highly individual short cut suits the model’s personal style perfectly!